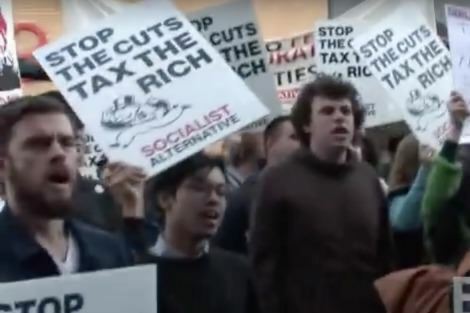 The chants were thunderous and sustained, as the suited and elegantly coiffed guests began to arrive for the Liberal Party fundraiser at Docklands. Initially there did not seem to be a significant police presence, and it appeared that the need for security was not considered high. I stood apart, with a group of 20 or so protestors bearing signs calling for the closure of Manus and Nauru. We were having trouble regarding the question of whether or not to join the 200 student protestors who were bellowing their own three-word slogans to the bewildered guests. The noise built to a cacophony and our small group decided to remain apart, at the entrance to Central Pier. As daylight was fading, the atmospherics grew darker. I am a veteran of many protests from the Vietnam war to the Franklyn River Blockade and many refugee rights and climate change demonstrations. However today the mounting tension in the air made me uneasy. This was unlike any march of thousands, along sunny Melbourne streets, with goodwill and camaraderie in abundance. The shouts were about money, marginalisation and betrayal. These students were our discontented youth in the process of their own version of radicalisation. The intensity levels rose, as startled guests arrived to be greeted with accusations of 'You are supporting child abusers' and 'F off you Liberal scum'. Then police started running in pursuit of students as they swarmed towards the entrance. There were scuffles and I saw someone fall backwards down steps. My observation was limited by the recent loss of much of the vision of my left eye; but the mounting pressure was visible. As the chanting rose to a crescendo, chaos ensued as protestors and panicked police rushed hither and thither. The mounted police arrived; but there seemed no plan of crowd control. It was a small protest but it was locked into a contained area with only one entrance. "The education squeeze on the coming generations creates and increases disadvantage, and breeds disillusionment and anger. It does not foster a harmonious society." It seemed the fundraisers and the diners had no idea that there might be an outburst of public rage, despite recent cuts to so many significant services. Perhaps it was a metaphor for Canberra's blind indifference to the growing gap between privilege and poverty. The venue seemed ill chosen. On this day the students' indignation held sway. 'No hundred thousand dollar degrees.' 'No cuts to education.' Their chanting was operatic and movements almost choreographed. It was theatre. But beneath the display was deep outrage. Then the wounded started to emerge. I saw several young people led out by friends, wincing with tightly closed lids, blinded by pepper spray. I spoke to an ABC cameraman who squinted through capsicum-assaulted eyes. He was only doing his job. The spraying had been indiscriminate. He was led away by a colleague for treatment. I heard reports of police force. I found myself asking, What have we come to? Here was a gathering of wealthy privileged people dining at $1100 a head to raise money for the Liberal war chest, seemingly surprised at the rage this aroused. Outside a contingent of youth was howling at being denied pathways to their own prosperity. Could this have been handled better? What was the security plan? Why did it seem limited to force? Did this cause an escalation? The students who had survived the police assaults regrouped at the entrance. After discussion they declared that they had made their point and it was time to leave. The guests of honour, Malcolm Turnbull and John Howard, had not yet been sighted. The evening before I had attended a lecture by Professor Joseph Camilleri on the War on Terror. Among other things, he spoke of the 'radicalisation' of youth, including those in the west. A significant feature of radicalisation of youth is a lack of hope in the future and loss of meaning and purpose. In other words when youth feel unheard and excluded and can find no meaning or a place in the society they inhabit, nihilism and anger ensue. Extreme violent radicalisation has many other complex causes, of course. But the education squeeze on the coming generations creates and increases disadvantage, and breeds disillusionment and anger. It does not foster a harmonious society. The policy levers do matter. Education is an important pathway out of generational disadvantage. It is ironic and absurd that at a time when innovation and ideas are being extolled, the pathways from primary school to advanced education are under threat to all but the privileged. The youth of today will have to cope with a future of climate change and increasing destabilisation. Universal access to education should be a no brainer. "students" - tosh- the socialist alliance is a group that wants to pick a fight wherever they go; they don't care about the issue at hand. I always thought that making our tertiary education system an 'industry' with an increasingly 'user pays' emphasis on it a disaster. Tertiary education in Germany is, I believe, largely free. Germany is just as advanced an economy as we are if not more so. I hope our decision makers on tertiary education read this article. Meanwhile, there is discussion about where the 12 new subs will be built to replace the existing three, but none at all about whether they are necessary. Anything up to $60 billion just to put them in the water: big toys for big boys. An easy way to raise money for education would be for the unions to pay tax and be subject to the same governance laws that companies and company directors are. And your blind and unhelpful comment Dave is one of the obstructions young people - and the rest of us - have to confront and overcome in pursuit of justice and equity. As Lyn Bender says of the 'education squeeze' on future generations,it "creates and increases disadvantage and breeds disillusionment and anger. It does not foster a harmonious society" ...or a fair one. . The demonstrations do not surprise me in the least. With a Government intent on reducing help to the disadvantaged and so called losers in our society, anger is sure to increase. We have seen the latest examples in the so called 'Panama Papers' and the disgraceful behaviour of the Banks and certain other rich individuals who have now been exposed for who they are. The greed is almost mind blowing. I am deeply concerned for my children and grandchildren's future in this neo liberal dog eats dog society that we are now seeing. It is so sad! You are absolutely correct Lyn - education is a vital pathway out of generational disadvantage. Tragically too many of the privileged just don't see that that is exactly what they are, privileged. And instead of reaching out in compassion to others less privileged they blame, shame and exclude. Hang on! There are more university students than ever before and society pays more money to them than ever! If there is a future squeeze it will be on tax-payers having to fork out for all this largesse which is on borrowed money; we have the most cossetted generation ever seen, and and is unsustainable. Dave`s comments are right on the button! Children born in affluent times grow up expecting everything to come their way easily. When presented with the bill, they react like babies denied their latest whim. Their lot would be made easier if Governments, in affluent times, put aside provisions for leaner times to come instead of using surpluses to buy votes. The situation is exacerbated if policies seem designed to increase the inequality between the privileged and those struggling to meet the demands of life. Life's pendulum always tends to swings one way, then the other. A more even beat, if possible, would help everyone. Don't know what else to say - except this is accurate. This is what it is like. A lot of people worked very hard, for many years, to bring this state of things about. And now, here it is. Why is the Jesuit paper pushing a socialist agenda. This is misplaced. Education is vital and so is funding it. I went to university and paid for it when I hit a particular tax threshold and paid my loan back. Todays students are investing in their own future,. They take a loan like every other business person and then they pay it back. If this is the squeeze you refer to then todays kids need to get used to it. They have grown up in the most affluent times in Australian history and they want more... My wife and I are the face of todays 1%. I have never had a new car, my wife cuts out coupons for retail stores where she knows she will save money and I worked more than 100 hours a week for 20 years. We are late 40's and debt free. So many others I worked with along the way earnt so much more and now have so much less because they always had new european cars, ate out all the time, vacationed in exotic destinations, wore lovely clothes , talked on the latest phones with expensive plans and had beautiful homes. I still have a coffee at home because I cannot justify paying $4.50 for a strong latte. I figure that has saved me $32,850 in the last 10 years because I have two a day ( both at home )..
A brilliant and perceptive article. It is worse in indigenous communities in the north where our attempts for funding support to continue a highly successful Early Parenting and Learning Centre (Pre-natal to 3 years) where FASD impact 1 in 5 kids is dismissed by PMC as "Poor value for money compared with the alternatives". Prison being the preferred alternative it seems. Already 80% of juveniles in prison are indigenous. Are the wealthy and privileged so blinded by their own hubris as to plunge our society (via unthinking policy) into social cataclysm? Think back to Hockey's unthinking glib assertions about people who have poorly paid jobs and inability to afford housing. That ignorance is execrable and may come home to roost with chooks such as these. Lyn Bender, in your article you said that you saw demonstrators coming out wincing their tightly closed lids blinded by pepper spray and you heard reports of police reports. Well after screaming "F off you Liberal sum", what do you expect from these demonstrators full of hate of Liberal supporters. You are a veteran of many demonstrations, Vietnam, Franklyn River Blockade, Climate change. All these demonstrations including the students are Left-Wing Socialists demonstrations. Thank God that Australia is now under a Coalition of Liberal and National Federal Government. '... there seemed no plan of crowd control.' ' ... seemingly surprised at the rage ...'! Fatted complacency, Versailles, Marie-Antoinette ... suchlike, come to mind. The degree of cynical currency of: 'It may not be just or right, but then life isn't fair, you know; so get with it! Get on with it. Move on! Or lose!' is redolent herein. Blatant nonsense policy with, presciently, ONLY destructive longterm ramifications, sure as eggs is eggs, enrage and radicalise. Patient, skilled, sensitive life-long educative process for each and all on Earth is the crucible of hope and trust in humanity. Corrosive gnawing away at alert civil awareness of fundamental human rights, and so at civilised behaviours and at the implementation and usage of millennia of hard won rights and responsibilities: of civil duties, confront here the not even civilised behaviours and claims, but indulgences of naïve and regressed narcissistic Capitalist consumerisms and far, far more curiosity than care. Poverty of spirit is exhibited in the blindness to myriad options available - just as the material poor coal face a growing decrease in options to the ultimate delimitation of their bodily existence. Sadly Dave has confused Socialist Alliance and Socialist Alternative. I don't know why as the photo made it clear that it was Socialist Alternative who was at the education protest. Socialist Alliance people were at the peaceful protest for asylum seekers. Frankly I think it is vital that these protests for asylum seekers remain peaceful as we desperately need to build community support. After all, people's lives are at stake. Unfortunately this didn't get much publicity due to the education protest held at the same time. Thanks for the report - a port where my 10pound pommie in-laws came in 1964 from Leeds UK. From a class society of selfish Tory's who feel entitled to their wealth not a Commonwealth...The worker's paradise was in Australia long fought by middle class activists like yourself, Lyn. Minimum wages and a fair go meant by the time my husband and my parents came over they had the best wages from their factory grind with money to spare, and the next generation to have a more resilient foundation. Before we met in Melbourne Roy and I shared the fact that as young adults we had thought to go back to England to fight in the revolution against Thatcherism! I still think it is vital we share the vision of a Fair Go - of a Common Wealth. e.g. those Howard tax cuts we are all paying interest on still, give back to Treasury for the common good! Well said Lyn. We need investment in public education and infrastructure development specially in the clean energy area. Thank you, Lyn and well said. I fear the direction this conservative government is taking - excellent education and health care for all are signs of a developed society. Thanks Lyn for a thought provoking article. The links between affordable education and a "socialist" agenda seem a bit tenuous, but if "socialists" are for access to education, is that not a good thing? It seems to me the current dominant attitude is that education is a commodity like coal or iron ore, to be exploited for profit, but to the point where it is becoming unaffordable for many. Is it really so hard to see that the protestors have a valid point? I note a number of posts use "socialist" as an epithet or in derogatory terms. Personally, I have no objection to being called a Socialist, but please note I capitalise the word. For those who nightly praise the Lord for the existence of the Nats and Libs please consider this: if there is an apparent increase in the number of Socialists, or in the amount of noise they make, it is probably because our society is being skewed further and further to the right. As this swing to the right happens, more and more of us, who decline to follow the swing, will find ourselves in the column headed "Socialist". One day there will be a correction.. I hope it will not be a violent one. A quibble Lyn, but it affects real people. "Canberra's blind indifference". A lot of good people live and work in Canberra, as I used to. They are not the problem. It's the transients sent there by the rest of the country who do all the damage. And if you still want to blame "public servants", it's still the transients who are in charge. So you meant "parliament's blind indifference", or "the major parties' blind indifference". Otherwise, well said, and I'm a bit saddened to see on Eureka Street the superficial, ill-informed reactions that blind some commenters to what's happening to the country. 'It was the best of times, it was the worst of times... so like the present period that some of its noisiest authorities insisted on its being received... in the superlative degree only'. Some of the comments on Lyn's article remind me of the responses of the wealthy classes to the protests of the poor and disenfranchised of the late 18th and early 19th centuries. It was all too easy to ascribe all manifestations of protest from peaceful marches to machine breaking to the work of Jacobins or Jacobites or any other variety of dissent. The beauty of that approach was that it allowed the ruling classes to ignore the real underlying basis for resentment and complaint. The blind faith in the market expressed by a number of those commenting above reminds me of the blind faith in the British 'constitution' expressed by those who benefited most from it in The times to which Dickens was referring. Read the list of titles of five of Lyn's articles - printed in red. A fine poem, just as written on this page. Claim it, Lyn. There was a major thrust by the universities to support the Government policy to permit the Universities to set their own fee structure for academic courses, perhaps with a notion for free-market competition between institutions. Anyhow, such a policy brought about talk of paying $100,000 for a degree. Also, Student Grants had become Student Loans and a higher degree implied a greater post-graduate debt. Of course, if you had to pay for the course yourself, you'd want your tertiary institution to be accountable for the quality of the service they provided, perhaps in legislation pursuant to the 1974 Commonwealth Trade Practices Act. Unfortunately, in most cases, where the entity is an institution of State legislation, that is not the case, since the Trade Practices Act, as it has evolved, does not apply to government institutions. Instead, all complaints about universities are directed to the relevant Ombudsman and may take years to resolve. The ACCC [Australian Competition and Consumer Commission] has no involvement; there has been no established student union support; and the Ombudsman is not obliged to assist you with the administration of your complaint. Surely, it is obvious: This 'User-Pays' scheme has knobs on it.